The hot, dry weather has reduced warm season hay production to almost nil in many parts of the state. With many pastures going white, cattle producers are having to break into what hay they do have far earlier than expected. OSU Extension Beef Cattle Specialist Dr. Glenn Selk says there are a number of simple, inexpensive strategies producers can employ to stretch what hay supplies they do have to the max. Selk said producers put the hay in rings inside an enclosed area where they can let the cows in for about six hours and then drive them back out. He said the performance of the cattle, though not quite as good as when they had 24-hour access, was still quite acceptable. He said the data indicates using hay rings with enclosed bottoms can reduce hay wastage by up to 30 percent. “The third management tool that we can incorporate with these cows is when we get into our supplementation program, probably in the fall and winter months, is to include an ionophore and there’s generally such things as Rumensin or Bovatec that can be included in a pelleted supplement feed. These particular products we know can make the utilization of the feeds, and particularly the forage-type feeds, a little more efficient in these cattle. 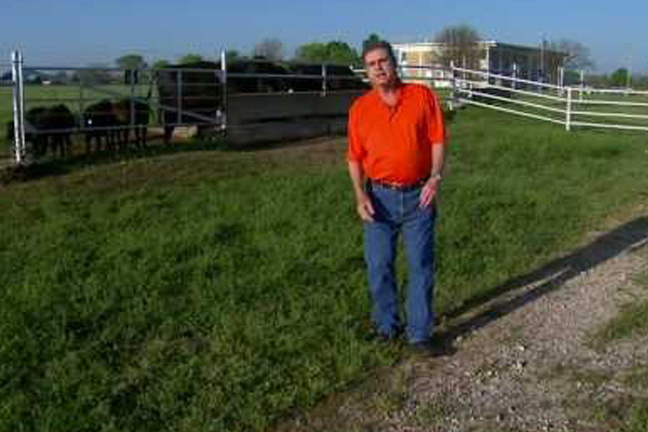 Ron Hays Beef Buzzes with Dr. Glenn Selk about hay feeding efficiency.